Stand alone or integrated into a wall. Casing made of hard plastic. Ideal for RFID purposes. Front end can be customized in any material for an appealing look. Front deposit in different versions and colors available. Handicapped accessible system: input height from 800 mm. User-friendly handling of a return station. Screen messages easily customized by library staff. Alternative user languages are individually definable. Fire detection and suppression systems available. 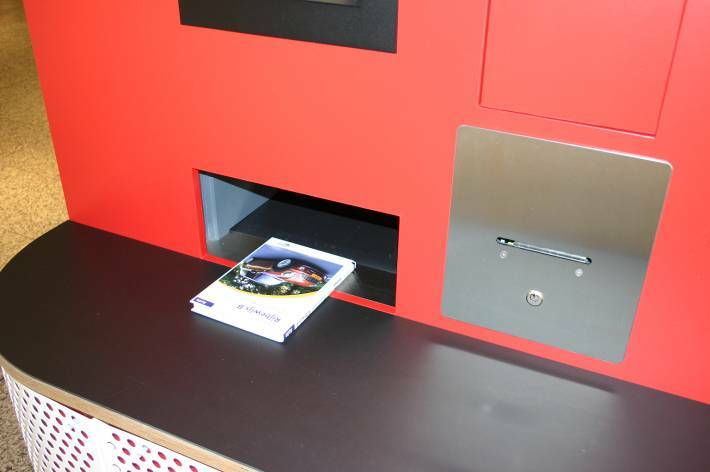 A slide prevents that customers entering in materials too fast. Patrons initiate the return process by placing the items on the conveyor one at a time. Items are then transported behind a small door/slide/pane that closes automatically so that the patrons can no longer retrieve them, sluice. The sluice is a secure segment of the return unit that will reject any item that have not been successfully read and identified as a legitimate library item. Once the door is closed, the sluice, a secure segment of the Sorter, will check and identify if the material is a legitimate library item. If it is not a legitimate library item the material will be returned to the patron. If it is a legitimate library item the material will be marked as returned in the ILS and the EAS (Electronic Article Security Bit) is reactivated. Material is transported in the direction of a bin or AMH System. The slide/pane opens again prompting the patron to enter the next item. 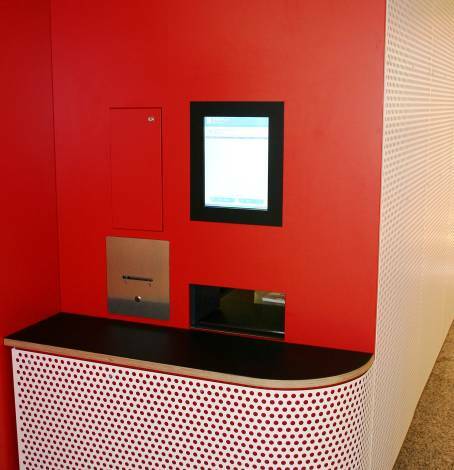 As materials are returned, the customer is led through the whole return process by animations and status messages on a convenient touch-screen. The media is identified and a return is initiated with the database. If accepted, the EAS/AFI function (security bit) is activated and the conveyor belt transports the books forward to a Bin or sorting system. The received media are listed clearly on the display. If a patron places materials that are not identified by the library software, that are missing parts (i.e.. book with CD) and considered incomplete or multiple items on the return belt at the same time, they will not be accepted and an error message will display on the screen with further information for the patron. Not accepted media, i.e. incomplete sets, causes a message on the display and the patron is asked to remove the item. If desired the customers can get a receipt or by pressing the receipt button after finishing a return session. Offline functionality is available should the network or library program not be available.